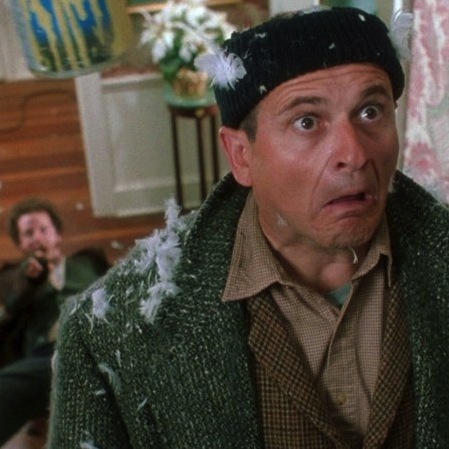 Could You Survive In Home Alone? A question I have asked myself many times (mainly because I have seen the film so many times): how the hell to the burglars in Home Alone survive all of those injuries? I mean, there’s suspension of disbelief and then there’s just plain ridiculous! You’d be pretty cross with just the heated-doorknob-hand-burn, the broken-Christmas-baubles-in-foot episode and getting feathers stuck to your face, wouldn’t you? Slipping down iced steps and cracking your head on the concrete would surely finish you off! Well, wonder no more – The Week called in some professionals to tell us exactly how badly hurt you’d be if you were a Wet Bandit attempting to steal the massive telly screens and bad-taste ornaments from the McCallister household. If you have absolutely no clue at all as to what I’m talking about then please Google Home Alone and then find I way of watching it – it’s staple Christmastime television. I have embedded the original trailer below, or click here to watch it on Youtube. I actually think that it might be on TV this week – tomorrow maybe? Do let me know if you happen to browse through the Radio Times. Next Post Why is my Mum wearing a Sanitary Pad on her Chin?